AIA Seattle annually offers over 50 continuing education opportunities. Learn more about Continuing Education requirements for licensed architects, as well as maintaining your transcript, and online education options. What are today’s key drivers of change in healthcare and healthcare environments, and how do we approach these changes? How do we measure the social and economic value of innovation, manage risk, and keep humans at the center of design? We welcome AEC and healthcare professionals to join us at this dynamic program that concludes with a virtual tour of St. Charles Bend’s new patient tower under construction. This year’s series will include four half-day sessions that explore a variety of codes-related topics. Each year, codes experts determine the most relevant topics to focus on, including recent local code updates, existing building requirements, accessibility, and compliance issues and implications. 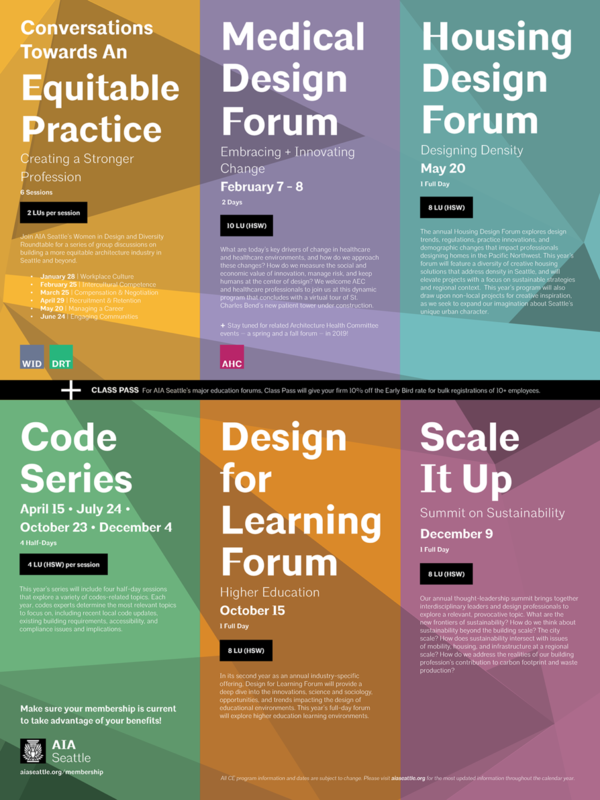 In its second year as an annual industry-specific offering, Design for Learning Forum will provide a deep dive into the innovations, science and sociology, opportunities, and trends impacting the design of educational environments. This year’s full-day forum will explore higher education learning environments. Our annual thought-leadership summit brings together interdisciplinary leaders and design professionals to explore a relevant, provocative topic. What are the new frontiers of sustainability? How do we think about sustainability beyond the building scale? The city scale? How does sustainability intersect with issues of mobility, housing, and infrastructure at a regional scale? How do we address the realities of our building profession’s contribution to carbon footprint and waste production? Filmed live at AIA Seattle’s 2018 Housing Design Forum, Inspiration, Innovation, Impact: The Future of Residential Design is now available online through aecKnowledge. This series features 10 captivating speakers and combines keynote presentations, case studies, research and provocative dialogue. Find out how today’s most inspired architects and thinkers employ innovative performance strategies, explore materials, and engage with questions about the future of housing design. Featuring keynote speaker Stephen Kieran, FAIA, LEED Fellow (KieranTimberlake). And if you missed this forum in person: Inspiration, Innovation, Impact: The Future of Residential Design is available online through aecKnowledge. Earn up to 5.75 LU/HSW. Save 20% when you purchase the 5-part series. 2018 Code Series: Got Codes? 2018 Summit: Contested Spaces: What is a city for all? Explore additional learning opportunities on our Calendar.